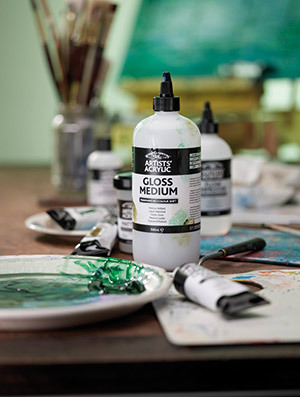 Acrylic mediums are used to create an even wider variety of techniques and effects and to prevent overthinning. Changing consistency and finish Acrylics can be safely altered to a very large number of different consistencies, from a thin fluid to a thick gel. Each consistency is available in either matt or gloss. Acrylic Matt Medium or Acrylic Gloss Medium maintain the consistency of the colour whilst improving flow and transparency. Colours will remain usable slightly longer when mixed with medium. Acrylic Flow Improver improves flow without any loss in colour strength. This helps the application of flat, even areas of colour. Using a glazing medium you can create brilliant jewel like glazes with acrylic paint. The fluid consistency of Acrylic Fluid Matt Medium or Acrylic Fluid Gloss Medium are excellent for glazing and staining techniques. The results are much more stable than when thinning with water alone (see avoiding overthinning). Acrylic Flow Improver increases the staining of raw canvas. Acrylic Matt Gel Medium or Acrylic Gloss Gel Medium thicken the consistency of the colours, accentuating brush marks and textures in the painting. Liquithick Gel Thickener thickens the colour even more, used in small amounts, it produces handling characteristics very close to oil or encaustic paint. At higher concentrations it can thicken paint or mediums to "cake" or sculptural consistency. If the acrylic is drying a little too quickly for you, Acrylic Retarder can be mixed with the colour. This gives more blending time for example on the canvas or slower drying on the palette. Acrylics Palettes can also be used to keep the colour usable for days. The fast drying and adhesive nature of acrylics make them ideal for building up layers of colour using the added texture of mediums for a unique range of effects. Mediums are available with added natural textures like sand and flint and a range of transparent textures from fine to coarse. In paintings, landscapes and buildings work particularly well with the added texture. Texture gels and natural texture gels also have infinite craft applications, from stencilling to model making. Water is used to dilute acrylic colour and clean brushes and palettes after painting. However too much water causes overthinning. As the water thins the acrylic colour by diluting the acrylic binder, if too much is used there will be insufficient binder remaining to bind the pigment. A matt or uneven finish will appear on the painting and the work will be susceptible to scuffing and damage. Overthinning is avoided by the use of mediums in addition to water. Varnishes are used to protect finished paintings from dirt and grease. Picture varnishes should be removable so that paintings can be cleaned when the varnish itself has become dirty. Although modern varnishes for oil colour can be used on acrylics, the removability can be safer with a dedicated acrylic varnish. There are a number of acrylic varnishes available, in different finishes, gloss, satin and matt. These can also be mixed by the artist to achieve their preferred level of finish. Furniture, toys and murals which are handled often need a hard finish. This can only be achieved with a non-removable varnish, the most popular of which is polyurethane. The colour of this varnish will slightly deepen the tone of your picture but this cannot be helped.